The following is an excerpt of Infinite Powers: How Calculus Reveals the Secrets of the Universe by Steven Strogatz. Without calculus, we wouldn’t have cell phones, computers, or microwave ovens. We wouldn’t have radio. Or television. Or ultrasound for expectant mothers, or GPS for lost travelers. We wouldn’t have split the atom, unraveled the human genome, or put astronauts on the moon. We might not even have the Declaration of Independence. It’s a curiosity of history that the world was changed forever by an arcane branch of mathematics. How could it be that a theory originally about shapes ultimately reshaped civilization? For reasons nobody understands, the universe is deeply mathematical. Maybe God made it that way. Or maybe it’s the only way a universe with us in it could be, because nonmathematical universes can’t harbor life intelligent enough to ask the question. In any case, it’s a mysterious and marvelous fact that our universe obeys laws of nature that always turn out to be expressible in the language of calculus as sentences called differential equations. Such equations describe the difference between something right now and the same thing an instant later or between something right here and the same thing infinitesimally close by. The details differ depending on what part of nature we’re talking about, but the structure of the laws is always the same. To put this awesome assertion another way, there seems to be something like a code to the universe, an operating system that animates everything from moment to moment and place to place. Calculus taps into this order and expresses it. Isaac Newton was the first to glimpse this secret of the universe. He found that the orbits of the planets, the rhythm of the tides, and the trajectories of cannonballs could all be described, explained, and predicted by a small set of differential equations. Today we call them Newton’s laws of motion and gravity. Ever since Newton, we have found that the same pattern holds whenever we uncover a new part of the universe. From the old elements of earth, air, fire, and water to the latest in electrons, quarks, black holes, and superstrings, every inanimate thing in the universe bends to the rule of differential equations. I bet this is what Feynman meant when he said that calculus is the language God talks. If anything deserves to be called the secret of the universe, calculus is it. By inadvertently discovering this strange language, first in a corner of geometry and later in the code of the universe, then by learning to speak it fluently and decipher its idioms and nuances, and finally by harnessing its forecasting powers, humans have used calculus to remake the world. That’s the central argument of this book. If it’s right, it means the answer to the ultimate question of life, the universe, and everything is not 42, with apologies to fans of Douglas Adams and The Hitchhiker’s Guide to the Galaxy. But Deep Thought was on the right track: the secret of the universe is indeed mathematical. Feynman’s quip about God’s language raises many profound questions. What is calculus? How did humans figure out that God speaks it (or, if you prefer, that the universe runs on it)? What are differential equations and what have they done for the world, not just in Newton’s time but in our own? Finally, how can any of these stories and ideas be conveyed enjoyably and intelligibly to readers of goodwill like Herman Wouk, a very thoughtful, curious, knowledgeable person with little background in advanced math? In a coda to the story of his encounter with Feynman, Wouk wrote that he didn’t get around to even trying to learn calculus for fourteen years. His big novel ballooned into two big novels—Winds of War and War and Remembrance, each about a thousand pages. Once those were finally done, he tried to teach himself by reading books with titles like Calculus Made Easy—but no luck there. He poked around in a few textbooks, hoping, as he put it, “to come across one that might help a mathematical ignoramus like me, who had spent his college years in the humanities—i.e., literature and philosophy—in an adolescent quest for the meaning of existence, little knowing that calculus, which I had heard of as a difficult bore leading nowhere, was the language God talks.” After the textbooks proved impenetrable, he hired an Israeli math tutor, hoping to pick up a little calculus and improve his spoken Hebrew on the side, but both hopes ran aground. Finally, in desperation, he audited a high-school calculus class, but he fell too far behind and had to give up after a couple of months. The kids clapped for him on his way out. He said it was like sympathy applause for a pitiful showbiz act. I’ve written Infinite Powers in an attempt to make the greatest ideas and stories of calculus accessible to everyone. It shouldn’t be necessary to endure what Herman Wouk did to learn about this landmark in human history. Calculus is one of humankind’s most inspiring collective achievements. It isn’t necessary to learn how to do calculus to appreciate it, just as it isn’t necessary to learn how to prepare fine cuisine to enjoy eating it. I’m going to try to explain everything we’ll need with the help of pictures, metaphors, and anecdotes. I’ll also walk us through some of the finest equations and proofs ever created, because how could we visit a gallery without seeing its masterpieces? As for Herman Wouk, he is 103 years old as of this writing. I don’t know if he’s learned calculus yet, but if not, this one’s for you, Mr. Wouk. As should be obvious by now, I’ll be giving an applied mathematician’s take on the story and significance of calculus. A historian of mathematics would tell it differently. So would a pure mathematician. What fascinates me as an applied mathematician is the push and pull between the real world around us and the ideal world in our heads. Phenomena out there guide the mathematical questions we ask; conversely, the math we imagine sometimes foreshadows what actually happens out there in reality. When it does, the effect is uncanny. To be an applied mathematician is to be outward-looking and intellectually promiscuous. To those in my field, math is not a pristine, hermetically sealed world of theorems and proofs echoing back on themselves. We embrace all kinds of subjects: philosophy, politics, science, history, medicine, all of it. That’s the story I want to tell—the world according to calculus. This is a much broader view of calculus than usual. It encompasses the many cousins and spinoffs of calculus, both within mathematics and in the adjacent disciplines. Since this big-tent view is unconventional, I want to make sure it doesn’t cause any confusion. For example, when I said earlier that without calculus we wouldn’t have computers and cell phones and so on, I certainly didn’t mean to suggest that calculus produced all these wonders by itself. Far from it. Science and technology were essential partners—and arguably the stars of the show. My point is merely that calculus has also played a crucial role, albeit often a supporting one, in giving us the world we know today. Take the story of wireless communication. It began with the discovery of the laws of electricity and magnetism by scientists like Michael Faraday and André-Marie Ampère. Without their observations and tinkering, the crucial facts about magnets, electrical currents, and their invisible force fields would have remained unknown, and the possibility of wireless communication would never have been realized. So, obviously, experimental physics was indispensable here. But so was calculus. In the 1860s, a Scottish mathematical physicist named James Clerk Maxwell recast the experimental laws of electricity and magnetism into a symbolic form that could be fed into the maw of calculus. After some churning, the maw disgorged an equation that didn’t make sense. Apparently something was missing in the physics. Maxwell suspected that Ampère’s law was the culprit. He tried patching it up by including a new term in his equation—a hypothetical current that would resolve the contradiction—and then let calculus churn again. This time it spat out a sensible result, a simple, elegant wave equation much like the equation that describes the spread of ripples on a pond. Except Maxwell’s result was predicting a new kind of wave, with electric and magnetic fields dancing together in a pas de deux. A changing electric field would generate a changing magnetic field, which in turn would regenerate the electric field, and so on, each field bootstrapping the other forward, propagating together as a wave of traveling energy. And when Maxwell calculated the speed of this wave, he found—in what must have been one of the greatest Aha! moments in history—that it moved at the speed of light. So he used calculus not only to predict the existence of electromagnetic waves but also to solve an age-old mystery: What was the nature of light? Light, he realized, was an electromagnetic wave. Maxwell’s prediction of electromagnetic waves prompted an experiment by Heinrich Hertz in 1887 that proved their existence. A decade later, Nikola Tesla built the first radio communication system, and five years after that, Guglielmo Marconi transmitted the first wireless messages across the Atlantic. Soon came television, cell phones, and all the rest. Clearly, calculus could not have done this alone. But equally clearly, none of it would have happened without calculus. Or, perhaps more accurately, it might have happened, but only much later, if at all. The story of Maxwell illustrates a theme we’ll be seeing again and again. It’s often said that mathematics is the language of science. There’s a great deal of truth to that. In the case of electromagnetic waves, it was a key first step for Maxwell to translate the laws that had been discovered experimentally into equations phrased in the language of calculus. But the language analogy is incomplete. Calculus, like other forms of mathematics, is much more than a language; it’s also an incredibly powerful system of reasoning. It lets us transform one equation into another by performing various symbolic operations on them, operations subject to certain rules. Those rules are deeply rooted in logic, so even though it might seem like we’re just shuffling symbols around, we’re actually constructing long chains of logical inference. The symbol shuffling is useful shorthand, a convenient way to build arguments too intricate to hold in our heads. Humans have used calculus to remake the world. If we’re lucky and skillful enough—if we transform the equations in just the right way—we can get them to reveal their hidden implications. To a mathematician, the process feels almost palpable. It’s as if we’re manipulating the equations, massaging them, trying to relax them enough so that they’ll spill their secrets. We want them to open up and talk to us. Creativity is required, because it often isn’t clear which manipulations to perform. In Maxwell’s case, there were countless ways to transform his equations, all of which would have been logically acceptable but only some of which would have been scientifically revealing. Given that he didn’t even know what he was searching for, he might easily have gotten nothing out of his equations but incoherent mumblings (or the symbolic equivalent thereof). Fortunately, however, they did have a secret to reveal. With just the right prodding, they gave up the wave equation. At that point the linguistic function of calculus took over again. When Maxwell translated his abstract symbols back into reality, they predicted that electricity and magnetism could propagate together as a wave of invisible energy moving at the speed of light. In a matter of decades, this revelation would change the world. Excerpted from Infinite Powers by Steven Strogatz. Copyright © 2019 by Steven Strogatz. Reprinted by permission of Houghton Mifflin Harcourt Publishing Company. All rights reserved. 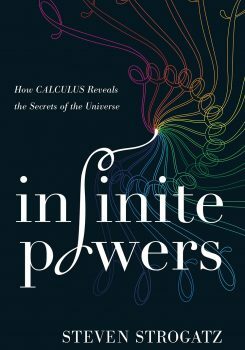 Steven Strogatz is the author of Infinite Powers: How Calculus Reveals the Secrets of the Universe (Houghton Mifflin Harcourt, 2019) and The Joy of X (Eamon Dolan/Houghton Mifflin Harcourt, 2012) and a math professor at Cornell University in Ithaca, New York. Three mathematicians talk about the latest topics and their start in math. Abstract math can be a tool to better understand power structures in society, says mathematician Eugenia Cheng, and to examine the injustice between groups.